Have you ever found yourself hovering over the edge of the cutting board so that you don’t knock your knuckles on the board as you reach the bottom of the stroke? 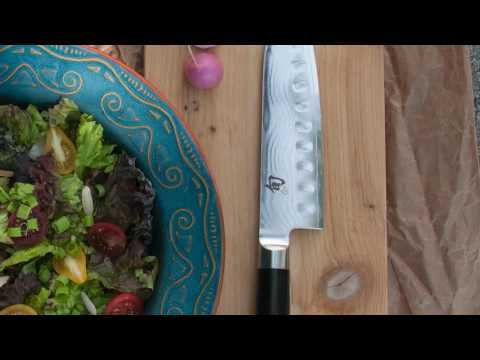 The Shun Offset Bread Knife solves the problem. The offset handle position creates additional knuckle clearance and perfectly positions your hand for a more powerful and thus, easier cut. The scalloped serrations will slice neatly into your loaf without skidding; no matter how crusty it is. You’ll also enjoy the way the knife glides through bread without shredding and with fewer crumbs. The Shun Classic Offset Bread knife works equally well on tender desserts such as angel food cake, enabling you to create beautiful, tear-free slices.